With this software you can hear what the room adds to the sound of your hifi system. Best to use a headphone for you tests or you will add the sound of your room two times ! 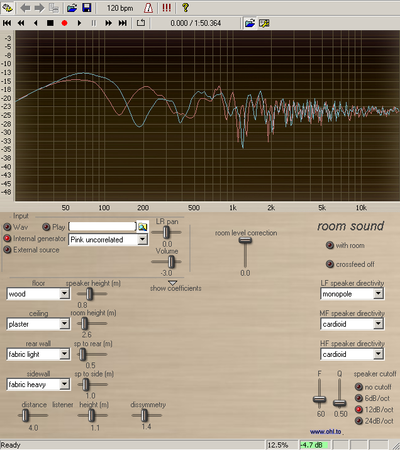 This software does what is called "auralization", this is a real time calculation of the influence of your room on the loudspeaker sound. This auralization is a quite simple one because it only uses first order reflexions. Those are calculated with a "mirror" sound source image method. The used absorption coefficients are approximative as is the speaker directivity indication. Despite of those limitations, it should give you quite a good indication of what the room does to your speaker sound. Using only the first order reflections is helpfull for me because it eases a lot calculations but also because those reflections, being merged with the direct sound, are those that have the most influence to the sound of your speakers. The later reflections are classified by your brain as not coming from your speakers. More info on the setup and functions of all my softs here. Listener distance is the distance from listener to loudspeaker. Tip : to avoid influence of a given surface, just set its distance to 0m but if you choose different type of directivities for LF/MF/HF, the curve may not be flat ! This version is still in beta : I have to search for the good values of the various coefficients of absorption, that’s why you can change those values directly in the soft to suit your needs or your materials. Absorption is also only considered by its real part (no complex calculation is done). I have added a crossfeed function because I think that the room sound is more natural sounding with this function on a headphone. Sometimes you see only small changes in the FFT curve but listen with pink noise, you may be surprised by the sound changes. Especially, changing wall materials is not so impressive on the curves but this is conform to acoustic calculations.